Japan's gold poop: What the heck is that? While browsing through the souvenir shops on a recent layover at Narita Airport, I came across a very curious Japanese good-luck charm. 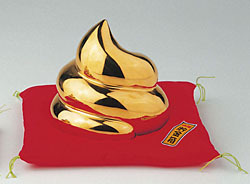 It featured — I kid you not — a gold poop which, by the way, looked disturbingly like soft ice cream! Why poop? Why gold poop? Personally, I can’t see anything felicitous in feces. Please tell me what the heck I’m missing. What you’re missing is a pleasing piece of word play. The product you saw is called Kin no Unko (The Golden Poo), a name that plays on the fact that the Japanese word for poop (unko) starts with the same “oon” sound as a completely unrelated word that means “luck.” Japanese enjoy this kind of pun — traditional storytelling is full of them — which may help explain why more than 2.5 million of the lucky little loads have sold in the last seven years. 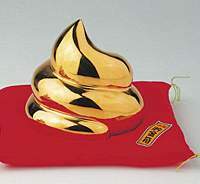 Although they’re made of real porcelain and coated with 24-karat gold, Kin no Unko products retail from just 105 yen for a mini poo to 2,100 yen for the big dump, which sits proudly on a silky red cushion. Even so, the line didn’t sell well until the spring of 2000, when high-school girls on school trips started snapping them up as silly souvenirs. The kids set off a hit-product boom, complete with news coverage from around the country. I admit feeling a little disappointed to learn that Kin no Unko is such a recent product. I suppose I had hoped it was a reflection of something deeper in Japanese culture. So on a hunch, I took a sample over to Kokugakuin University in Tokyo, one of just two universities in Japan with a department of Shinto Studies. Professor Takeshi Mitsuhashi looked the product over carefully, nodded thoughtfully, and gave me just the story I had come for. Mitsuhashi explained that there are many word plays in Japanese religion because puns make information easier to teach and remember. One example is a talisman in the shape of a frog used to pray for the safe return of a loved one, the pun being that the word for frog (kaeru) is a synonym of the verb “to return.” “This Golden Poo is very much part of that tradition,” Mitsuhashi asserted. Furthermore, there is a long history of poo-related worship in Japan, according to Mitsuhashi. The earliest recorded example is a god called Haniyasu, who is mentioned in the Nihon Shoki, an eighth-century text that is one of the most important records of ancient beliefs and practices. Haniyasu is still worshipped at Haruna Jinja, a well-known shrine in Gunma Prefecture. And until fairly recently, it was common to worship deities known collectively as benjo-gami (privy gods) by placing religious figures in or under the privy. Mitsuhashi, who is in his 60s, remembers his parents burying a pair of god figures, one male and one female, under the privy in his childhood home. The difference in perception may lie in toilet types: a Japanese-style toilet consists of a shallow basin built into the floor over which you squat. There’s little or no water in the basin until you flush the toilet. So to someone who grew up using Japanese-style toilets, a healthy result would be in the shape of a spiral pile.